By Dale Johnson Posted: August 13, 2018 6:00 a.m. 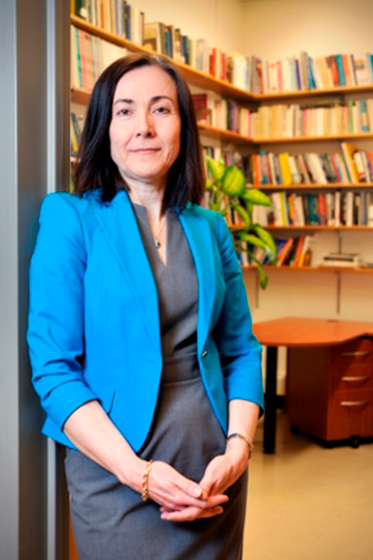 The new Associate Vice-President (Academic), Dr. Nilgün Önder, says her 15 years of experience at the University of Regina as both a professor and administrator prepare her well for her new position. She was the founding Coordinator of the International Studies Program, an undergraduate interdisciplinary program in the Faculty of Arts, from 2006-2011 and 2013-2015. “In that role, I gained a lot of experience in the areas of program development, academic advising, and inter-departmental collaboration – as well as activities expected of a department head,” Önder explains. In July 2015, she became Acting Associate Dean Research and Graduate, Faculty of Arts, and continued in the position until this past June. As well, she is an Associate Professor in Politics and International Studies in the Faculty of Arts. Önder received a B.Sc. degree with the highest distinction in Political Science and Public Administration from the Middle East Technical University, Ankara, Turkey. She then earned her MA at Wilfrid Laurier University in Waterloo, Ontario, and completed her PhD in Political Science at York University in Toronto. Her areas of specialization are International Relations, International Political Economy, and Comparative Political Economy. Her current research interests include the international political economy of global finance; global economic governance; international financial institutions; globalization and state transformation; and, Turkish politics. She has published articles in international journals and presented papers at numerous international academic conferences. Önder has seen plenty of changes since she joined the U of R in 2003. As well as the campus being larger, the student body is more diversified, with far more Indigenous and international students than ever before. “This is an important achievement, which needs to be recognized and further promoted. In my previous positions, I strove to contribute to both Indigenization and internationalization in a variety of ways. Over the past several years, the University has made significant progress in both areas. However, there is still room for improvement. As the Associate Vice-President (Academic), I will strive to make further contributions to these areas in collaboration with relevant stake-holders,” Önder says. “Another major change is the creation of new faculties, such as the Johnson-Shoyama Graduate School of Public Policy and the Faculty of Nursing, which have proved to be highly successful. These positive experiences highlight the need to search for and/or create opportunities for innovation and new academic initiatives,” she says. Önder also believes there is a need for more collaborations and partnerships. And Önder says she welcomes feedback as she works on her priority areas.